Through his work and travels, Jim came into contact with some of the world’s greatest puppeteers, many unknown outside their countries. He recognized that, like music, puppetry is a universal language that transcends national borders. His involvement with the Union Internationale de la Marionette (UNIMA), the international puppeteers’ organization, gave him access to artists on a personal level. Having celebrated together at the 1980 festival in Washington, DC, and with a related television special, Jim was eager to introduce a range of puppeteers and puppetry styles to greater audiences. In 1983, Jim began discussions with his production team about a television series highlighting six performers in their native countries. 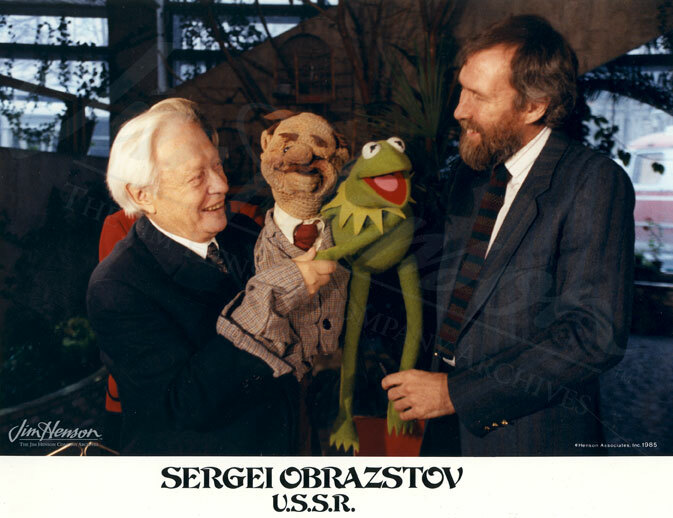 Five of the documentaries, under the banner Jim Henson Presents…The World of Puppetry, were co-productions with local television stations (the sixth, being about American Bruce Schwartz was not) and were filmed on location. Jim’s trip to Meppel, Holland in May 1984 with his younger son John marked the beginning of production of an episode featuring Dutch performers Henk and Ans Boerwinkel and their Figurentheater Triangel, produced in collaboration with KRO TV. The Boerwinkel’s work emphasized the visual and was related to themes of magical realism, integrating lighting and sound to create poetic moods. Using a combination of masks, marionettes, rod and hand puppets, their programs were full of surprising effects. By devoting a full episode to the Boerwinkels, Jim was able to discuss their craft with them in depth and still had time to showcase some extended samples of their performances. Along with the Boerwinkels and Bruce Schwartz, the other puppeteers presented in the series were Philippe Genty of France, Albrecht Roser of Germany, Richard Bradshaw of Australia, and Sergei Obraztsov of Russia. Jim enjoyed collaborating with all of these artists, but meeting Obraztsov had a special importance to Jim. As a teenager learning to make puppets, Jim checked out some books from the public library for instruction – one was Obrtazov’s 1950 book, My Profession. Video: Here is a sample of Jim and Henk Boerwinkel from Jim Henson Presents. 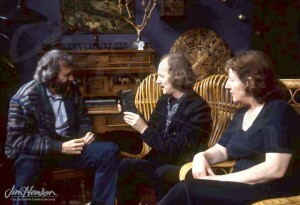 Jim with Henk and Ans Boerwinkel, 1984. 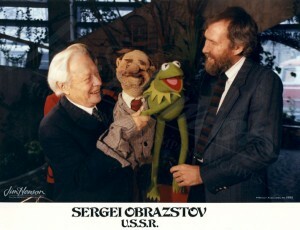 Jim and with Sergei Obraztsov, 1984. This entry was posted in 05-May '84, 1984, Jim Henson Presents and tagged Albrecht Roser, Ans Boerwinkle, Australia, Bruce Schwartz, France, Germany, Henk Boerwinkle, Holland, John Henson, Meppel, My Profession, Philippe Genty, Richard Bradshaw, Russia, Sergei Obraztsov, UNIMA, Union Internationale de la Marionette, washington DC. Bookmark the permalink.